Doug Coby finally found himself back in Victory Lane on Saturday night. The Milford, Connecticut driver dominated the second half of the Seekonk 150 at Seekonk Speedway and captured his first win of the 2017 season. He took the lead from Matt Hirschman on lap 63 and led all but one lap in the final stages en route to the win. "We just had an awesome car," Coby said. "My guys made awesome adjustments for the feature. When you can't pit for tires, you have to be stout off the truck. You have to know what to do for race. The car was just awesome. 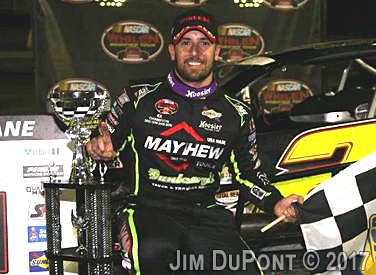 I'm really happy to get Mayhew Tools their first win with us." The win was the 23rd career in Whelen Modified Tour action for Coby and his first at the third-mile of Seekonk. The only blunder for Coby, who started fourth, came at lap 63 when Coby and Hirschman got together battling for the lead. While Hirschman spun, Coby was able to continue without damage and stayed at the front of the race until the checkered flag flew. He held off challenges from Ryan Preece and Anthony Nocella in the final dash to the finish on Saturday. Coby crossed the line 0.251 seconds ahead of Nocella. Prior to Saturday, Coby had three consecutive second-place finishes in Whelen Modified Tour competition. With his third-place finish, Preece took the points lead by two points over Coby. Rowan Pennink is third, three points back, while Timmy Solomito is fourth, 11 points back. Solomito crashed out while running inside the top five and finished 22nd. Justin Bonsignore was sixth, followed by Hirschman, Max Zachem, Gary McDonald and Wade Cole. Earlier in the day, Hirschman won his fourth career Coors Light Pole Award. The Seekonk 150 will air on NBCSN Saturday Sept. 2 at 9:30 p.m. The NASCAR Whelen Modified Tour returns to the track next Saturday night, Sept. 2, at Oswego Speedway in New York. 1. (4) Doug Coby, Milford, Conn., Chevrolet, 150 laps, 63.688 mph. 2. (13) Anthony Nocella, Woburn, Mass., Chevrolet, 150. 3. (2) Ryan Preece, Berlin, Conn., Chevrolet, 150. 4. (19) Matt Swanson, Acton, Mass., Ford, 150. 5. (5) Dave Sapienza, Riverhead, N.Y., Chevrolet, 150. 6. (15) Justin Bonsignore, Holtsville, NY, Chevrolet, 150. 7. (1) Matt Hirschman, Northampton, PA, Chevrolet, 150. 8. (12) Max Zachem, Preston, Conn., Chevrolet, 150. 9. (25) Gary McDonald, Ronkonkoma, N.Y., Chevrolet, 150. 10. (22) Wade Cole, Hartland, Conn., Chevrolet, 149. 11. (8) Rob Summers, Manchester, CT, Chevrolet, 148. 12. (6) Rowan Pennink, Huntingdon Valley, Pa., Chevrolet, 148. 13. (11) Craig Lutz, Miller Place, N.Y., Chevrolet, 148. 14. (17) Eric Goodale, Riverhead, N.Y., Chevrolet, 148. 15. (14) Ted Christopher, Plainville, Conn., Chevrolet, 146, accident. 16. (9) Ronnie Williams, Ellington, Conn., Chevrolet, 144. 17. (23) Melissa Fifield, Wakefield, N.H., Chevrolet, 143. 18. (21) Manny Dias, Attleboro, Mass., Chevrolet, 142. 19. (16) Jeff Rocco, Meriden, Conn., Chevrolet, 138, accident. 20. (24) Walter Sutcliffe Jr., East Haven, Conn., Chevrolet, 125, accident. 21. (18) Shawn Solomito, Islip, N.Y., Chevrolet, 118, accident. 22. (7) Timmy Solomito, Islip, N.Y., Ford, 63, accident. 23. (10) Andrew Krause, Holmdel, N.J., Chevrolet, 63, accident. 24. (3) Jon McKennedy, Chelmsford, Mass., Chevrolet, 63, accident. 25. (20) Calvin Carroll, Newton, N.J., Chevrolet, 47, ignition. Caution Flags: 7 for 34 laps. Lap Leaders: M. Hirschman 1-62; D. Coby 63-123; R. Preece 124; D. Coby 125-150. 6. E. Goodale, 379; 7. D. Sapienza, 352; 8. M. Swanson, 348; 9. M. Zachem, 337; 10. R. Summers, 327.